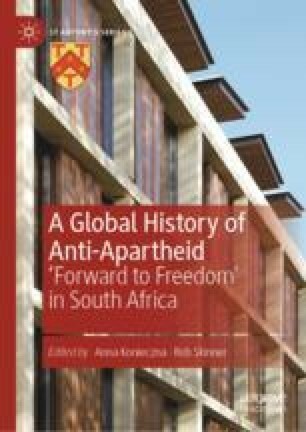 Especially after 1989–1991, scholarly and public accounts of transnational activism have been keen to draw connections and comparisons between the struggle against Apartheid on the one hand and the rise of dissidents’ movements in Eastern Europe on the other hand. It has been presented as the story of human rights and ‘global civil society’ that trumped the Cold War, bringing an end to both Apartheid and Communism after 1989–1991. Despite such narrations of one common struggle, we know strikingly little about how the Polish opposition in the 1980s dealt with anti-apartheid. Focusing on Solidarność’s leaders and ‘ambassadors’ as well as exile journals, diaspora communities, and Polish individuals, this chapter will investigate Polish dissidents’ views of and contacts with South Africa. It will argue that, contrary to the idea of one common anti-totalitarian struggle that was cultivated in the early 1990s, and in spite of the number of Polish activists with anti-apartheid sympathies, the Polish opposition was divided on the issue of South Africa and ultimately had only superficial links with anti-apartheid movements. Moreover, it will examine the reasons for these limited contacts: Cold War duality, the alliance between South African liberation movements and the Communist bloc, and other elements, including opportunism or even sympathy with the apartheid regime.